The term postprandial refers to bodily changes that occur after eating. Postprandial pain, or pain after eating, can be a symptom of a wide variety of digestive disorders. In this overview, we will cover some of the more common, and some of the less common reasons that you might be experiencing pain after eating. Note: Any unusual or persistent symptom of pain should be brought to the attention of your physician. The experience of severe pain may need immediate medical attention. 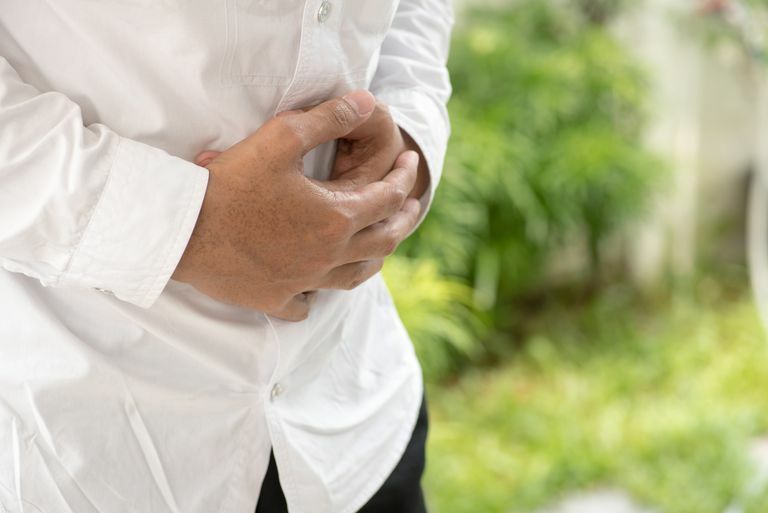 Dyspepsia: Pain after eating that occurs in the middle part of your upper abdomen may be caused by dyspepsia, often commonly referred to as indigestion. Dyspepsia may also cause a burning sensation in the same area. Bloating and nausea may also be experienced. Dyspepsia presents itself differently than gastroesophageal reflux disease (GERD). GERD may cause a sense of burning (heartburn), as opposed to pain, in the esophagus that radiates up toward the throat. Pancreatitis: Pancreatitis, inflammation of the pancreas, can result in the symptom of pain after eating, both in its chronic and acute form. Pain from pancreatitis occurs in the upper abdomen and can radiate toward your back. Other possible symptoms are nausea and vomiting. Peptic Ulcer: Peptic ulcers, sores that occur on the lining of the stomach or duodenum, can cause the symptom of pain after eating, particularly if the ulcer is in the stomach (gastric ulcer). Pain from a peptic ulcer is most often experienced somewhere between your sternum and your belly button. Gallstones: Pain from gallstones may occur after eating, particularly if the meal was large and/or high in fat. Gallstone pain typically occurs in the middle or the right side of your upper abdomen. The pain may also occur behind your sternum or radiate to your upper back. The pain may be experienced as "gripping" or "gnawing." Other symptoms of gallstones include nausea and vomiting. Irritable Bowel Syndrome (IBS): IBS is a health condition in which people experience chronic abdominal pain. By definition, such pain is associated with bowel movements as opposed to eating. However, the act of eating can trigger overly strong intestinal contractions that can result in abdominal pain. Pain from IBS can occur in the upper, middle and lower parts of the belly, but may also radiate upward to the upper parts of the torso. Aerophagy: Chronic burping precipitated by swallowing air. Intestinal angina (mesenteric ischemia): Problem with blood supply to the small intestine. Pain in the body means that there is something wrong. If you experience pain after eating only every once in a while and it is not debilitating, you may want to mention it to your doctor the next time that you see them. But if you are experiencing pain after eating on a fairly frequent basis, it is essential that you make an appointment right away with your doctor to ensure that you get an accurate diagnosis and come up with a treatment plan. Talley, N., Phung, N. & Kalantar, J. "Indigestion: When is it functional?" BMJ 2001 323:1294–1297. Vakil, N., et. al. "Symptom Overlap Between Postprandial Distress and Epigastric Pain Syndromes of the Rome III Dyspepsia Classification" American Journal of Gastroenterology 2013 108:767–774. Do You Know Why Bran Is Bad for IBS? What Do You Do When IBS and Gallbladder Issues Occur at the Same Time? What Should You Eat After Having Your Gallbladder Surgery?